All About Aquarium Fish: Which is better saltwater or freshwater? Which is better saltwater or freshwater? Most people often get attracted to the beauty and uniqueness of a marine aquarium, main reason is because it is a form of living art. To a small number of aquarist however, they prefer freshwater aquarium and it all depends on individual preferences. There are different arguments as to which one is better and therefore, this article here is meant to discuss and make a simple comparison to between those two. Keeping saltwater tank requires more knowledge and experience, apart from having the patience and sense of tediousness towards every small matter. Usually hobbyist that get involved in saltwater, are those that are already familiar with the in and out of freshwater tank before they start moving towards the more difficult and much challenging task of managing a saltwater tank setup. Unlike freshwater species, marine fish are very difficult to look after and they will not easily adapt to home aquarium environment. They are less tolerant to the slightest change in water parameter and sometimes, even a small shift in pH in terms of 0.5 unit difference can have a lot of impact. It is very common to hear even seasoned aquarist losing their whole stock of saltwater fish while for their freshwater counterpart, this is often very rare. 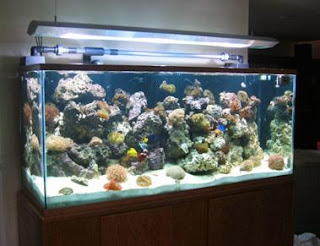 The main difference when it comes to maintenance is that, with freshwater aquarium, you can conduct water change as frequent as possible but this is totally the opposite when it comes to marine tank water change, because if things are not carried out properly, it will actually bring more harm than good. There are also more test parameters to look out for like salinity level, aquarium lighting intensity which all are very critical towards successfully managing your saltwater tank. Not only does it introduce a lot of hassles on daily maintenance but it also comes with it, high cost of setup. Based on my own experience, spending on water test kits alone will take up a large percentage of the budget that you need to allocate for your weekly fish supplies. Even the common fish flakes can cost twice as much since it is made of quality ingredients specially made for marine fish. The tubes for marine lighting has to be replaced at least every 6 months while the extra spending needed for the salt can also cost a lot. Saltwater aquarium will generally require a larger tank with minimum capacity measuring at least 55 gallon while freshwater setup can be as low as 5 to 10 gallon normally as what you see with mini aquariums. Other redundant equipment like protein skimmer is also needed for saltwater tank and a unit of these will easily take up few hundred dollars to purchase. Marine fish is usually caught by experienced divers in oceans and were then brought home to a quarantine tank in order to acclimatize the fish before selling it to pet shops. Therefore, unlike freshwater fish which will easily breed and multiple in fish farms worldwide, marine fish is very hard to breed and therefore new supplies are usually those that are caught from the wild. Nevertheless, this is also one of the factor that contributes to the high cost of setup as well. Find out more about different freshwater fish like neon tetra, silver dollar, platy and discus. Saltwater fish enthusiast can have a general readup on topics related to tropical marine fish, invertebrates, corals and live rock.